If you just need to make a bubble chart in Excel to demonstrate a relationship between two variables, then you can download and use this website’s free bubble chart Excel template. This template is easy to use and is probably the simplest way to make a bubble chart. However, this template is just one of three possible approaches to making a bubble chart – to see all three, please see the YouTube video at the bottom of this page. Bubble charts (or graphs) are similar to scatter plot charts, as they are designed to identify and visually show the relationship between two variables. Take this bubble chart as an example. 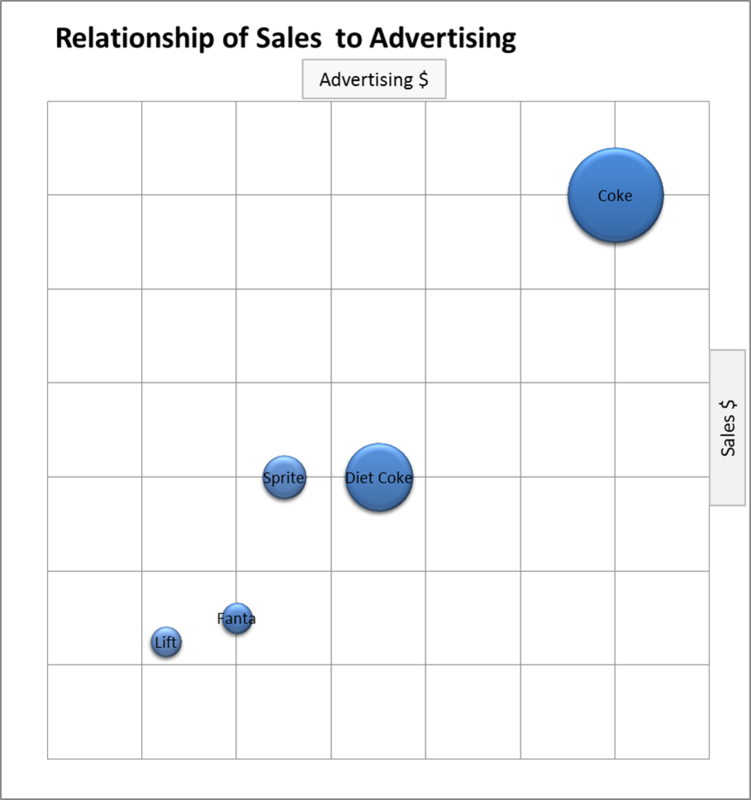 In this case, the total dollar sales of different brands of soft drink is graphed against estimated advertising spend. For these two marketing variables, you would expect to see a relationship, or what we normally refer to as a correlation. A correlation occurs when the data on the graph seems to follow a pattern – that is, there is a co-relation between the two variables. As you can see, these brands (for sales and advertising spend) tend to fall in a straight line. This indicates that as one variable increases, so does the other one. Logically, for this example, this relationship makes sense – as a greater level of advertising should normally result in higher sales volumes. The size of the circles, in this example, relates to market share. Coke is the market leader and has the largest circle, whereas Lift and Fanta have smaller market share and smaller circles. The download link to help you make a bubble chart in Excel is available at the top of this page. However, here is a screen shot of the input to the template to show you how easy bubble charts are to make.